Experts from the UN Human Rights Council will arrive in Colombo next month to “offer advice and technical assistance” to the Government towards implementing the US-backed resolution on Sri Lanka. In what seems a change of heart, the Government has responded to a letter from UN Human Rights High Commissioner Navanethem Pillay, that it would receive the expert delegation. Earlier, as revealed in the Sunday Times of May 27, the government was poised to reject the move. The acceptance has been conveyed through the External Affairs Ministry. The move follows the Government’s resolve to fulfil the provisions of the resolution. 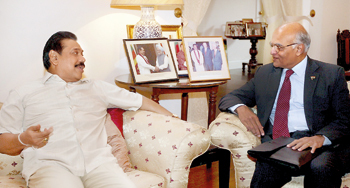 With this in mind, the Cabinet at its last meeting approved an Action Plan forwarded by President Mahinda Rajapaksa. One of the three main elements in the resolution adopted by the UN Human Rights Council called upon Sri Lanka to formulate a “comprehensive action plan” as “expeditiously as possible”. Another called upon the Office of the UN High Commissioner for Human Rights and relevant special procedures mandate holders to provide, in consultation with, and with the concurrence of, the Government of Sri Lanka, advice and technical assistance on implementing the provisions of the resolution. The latest Government decision, diplomatic sources in Colombo said yesterday, would pave the way for the visit to Colombo by High Commissioner Pillay herself. The UN special procedures and mandate holders will have talks with Presidential Secretary Lalith Weeratunga, among others. Mr. Weeratunga heads a Presidential Task Force which is responsible for the implementation of the recommendations of the Lessons Learnt and Reconciliation Commission (LLRC). Implementing these recommendations through “credible and independent” investigations is a main thrust of the US-backed resolution. In this regard, the Government delayed forwarding its Human Rights Report to the UNHRC in Geneva to incorporate provisions in the Action Plan and other “last minute issues”. This came after Sri Lanka’s Permanent Mission to the UN in Geneva challenged the computation of the deadline for the report – July 23 – had not been properly calculated. Thereafter, UN officials upheld Sri Lanka’s concerns and fixed August 9 as the deadline. On Friday, Secretary Weeratunga sent the updated report to Ravinatha Ariyasinha, Sri Lanka’s new ambassador to the UN in Geneva, for onward transmission to the UN office. It will now be translated into UN approved languages and posted on the official UN website.